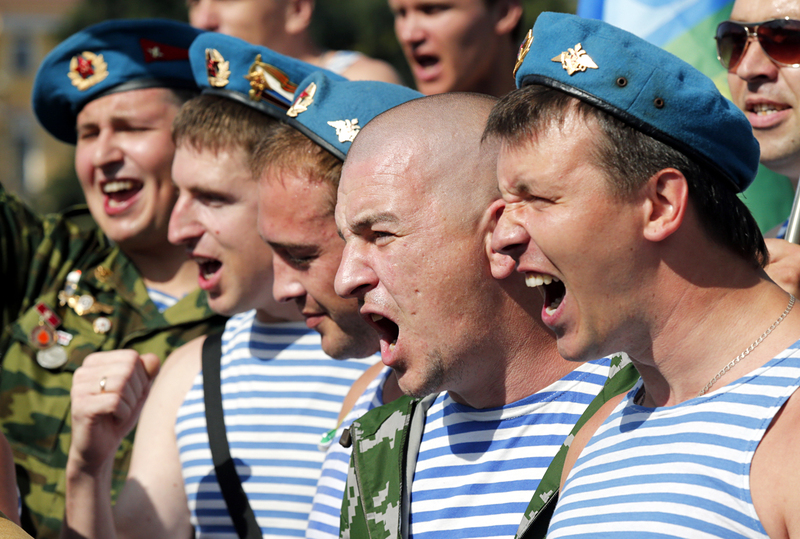 Former Russian paratroopers march and shout slogans during the Russian 'Paratroopers Day' celebrations at Dvortsovaya Square in St. Petersburg. Paratrooper Day in Russia is a very special holiday. Everyone who has served in this division feels obliged to go to a park, meet up with friends and have an exceptionally good time. But sometimes the merriment can become unsafe for bystanders. Every year on Aug. 2, Russia marks Paratrooper Day – the one occasion in the year when those who have served as military parachutists have free rein to let their hair down in public. Extended drinking, bathing in fountains and rivers and general horseplay is the rule. In order to immerse myself in the thick of the paratrooper holiday, I went to their traditional meeting place in Moscow – Gorky Park. This is what I learned about socializing with the blue berets without hurting yourself. The best way to discover you have something in common with a drunken ex-paratrooper is to go through the Russian armed forces yourself. Experiences in the barracks and relations among servicemen leave a particular impression on one's personality: You begin looking at things differently, you react to things more brusquely and more harshly and you begin speaking with a vocabulary and intonation that only military people can relate to. Unconsciously, you become "one of the servicemen." On this occasion you must quickly and clearly answer a series of questions: Where you served, in which unit, which weapon you fired and so on. But the main question that paratroopers love asking is: "Did you see combat or not?" This brings us to the second point of our survival guide: Do not show off! According to Alexander (surname not given), who was fortunate to be demobilized shortly before the first Chechen campaign (Dec. 11, 1994 – Aug. 31, 1996), none of his younger friends and acquaintances ever talks about what they went through. "No one will ever show off and tell stories about how he killed 10 people. Several years ago a friend who I've known since school told me that he had been less fortunate, that he in fact saw combat. He told me with pain in his voice what he had gone through," says the former paratrooper. His friend was captured by the enemy. There he was tortured – he was starved, deprived of sleep and beaten. "This is a pain that he is trying to forget. We can spot hotshots a mile away. Don’t they dare invent stories of their exploits," says Alexander. After our short confidential talk I was given a choice: Drink vodka or go swimming with the paratroopers in a fountain…. in my clothes. I immediately agreed to do some laps with the former servicemen and let my interlocutor swim up to the fountain's center first, something that made everyone accept me right away. I understood this when cheerful Alexander tried a wrestling move on me, one that he had perfected in his youth, attacking me by the feet. After the short scuffle in the fountain we got out all soaked and happy. Alexander even called to his son and told him to prepare a sandwich for me and give me a can of сola. I deserved them. If you have never served in the army but still wish to observe the celebrations of the men with the blue berets, you must plan an escape route – just in case the situation gets out of hand. For Paratrooper Day Moscow's authorities closed all the stalls, shops and cafes in the city parks. But I found one life hack: You can call the administration of the park you are going to and find out where you can hide if things get out of hand. There I was given the phone number of a café in Gorky Park that welcomed inattentive tourists.